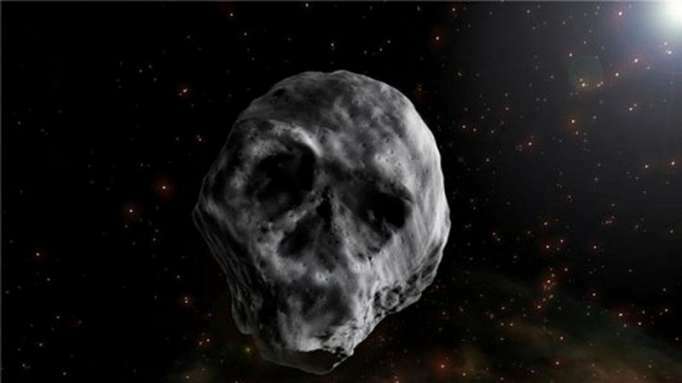 An asteroid that, in certain light conditions, resembles a human skull, will fly past Earth just after Halloween. In 2015, the asteroid flew past Earth at a distance of just 300,000 miles, Space.com reports. For comparison, the average distance between Earth and the Moon is 238,855 miles. First discovered on Oct. 10, 2015 by the University of Hawaii's Pan-STARRS-1 (Panoramic Survey Telescope and Rapid Response System), the “Halloween asteroid” is set to make another flyby in November, researchers say. However, it will be nowhere near as close to our planet this time. Asteroid 2015 TB145 will zoom past at 105 times the average lunar distance, SINC reports, citing a research study released last year. The space rock's diameter measures between 2,050 feet and 2,297 feet, according to scientists. Last year, a skyscraper-sized asteroid named (441987) 2010 NY65 flew past Earth at about eight times the distance between Earth and the moon. Also in 2017, asteroid Florence, a massive 2.7-mile long space rock, passed by Earth at 18 lunar distances. In 2016, NASA opened a new office to track asteroids and comets that come too close to Earth. The Planetary Defense Coordination Office (PDCO) formalizes the agency’s existing program for detecting and tracking near-Earth Objects, known as NEOs. This week, Japan’s space agency released stunning new photos and video of a distant asteroid’s rocky surface that were captured by two small rovers.